Above, Addi is enjoying some playtime with her brother Ace, & my left hand. One of our very first babies from our Silver Bengal stud *Champion Poolside Rascal Cats of KotyKatz*! This Silver Bengal is a wonderful little girlkitten! Parents PK-def & HCM tested. Addi is showing promise as a possible breeder/show quality kitten. Registered catteries may inquire. Please be sure to check back often for updated pictures and if you would like to be placed on our notification list to find out when this kittens. She is such a ball of joy & beauty. What a truly amazing kitten! Her play motor keeps going, & doesn’t stop. Bengal kittens can learn to walk on a leash? Any type of bengal harness you decide to use, one thing that you should make sure is that it is very secure. You want to be certain that it fits tight enough that your bengal kitty is unable to wriggle out. Just as important, you want to be sure that it is not so tight that they can’t breathe! Always be sure that you can fit two fingers between the jacket or the straps. This entry was posted in Bengal Kitten Gallery, Gallery and tagged silver bengal, silver bengal kitten. Bookmark the permalink. 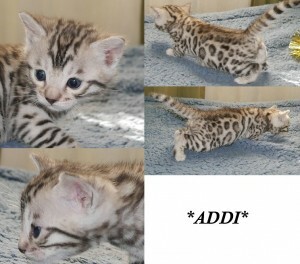 ← Spring Bengal Kitten Litters coming soon!